I wanted so much to start this post as a narrative, one that holds your hand and winds its way through my story sharing the shadows and surprises and leads you, along with me, to a place of discovery and peace. But the truth is, my diagnosis with an Autoimmune Disease was a bit of a shock. And the past 11 years spent living with it, while certainly a journey, have left me stumbling and tripping and grieving and learning to detach and accept that this cross is mine. And the journey – it is lifelong. I just can’t find the right narrative to gently walk you into this, and I’ve sputtered around for more than a week getting tangled up in words and efforts to do so and none of it felt authentic – so…let’s just rip off this bandaid. First, this post is probably long overdue. 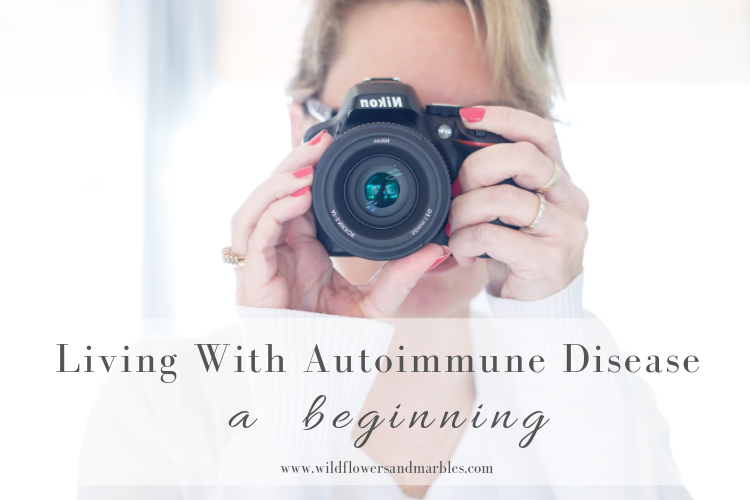 For years I didn’t share here about my Autoimmune disease because it just wasn’t a fit and truthfully, it just wasn’t something I was ready to share. For some time I didn’t share it because it was overwhelming enough to live with; I couldn’t write about it. I couldn’t come up with a single coherent thing to say. And then, as I slowly learned to accept this cross as mine, and began to detach, I wanted to do so quietly – without everyone gazing at me. In short, I needed the space to accept this. Space to try things, make mistakes, and try again. Then there came a point that I shared just a few details and your response was unmistakable – you were eager to hear more. Many of you wrote to tell me you are facing this, too. You’re struggling with Autoimmune and long for encouragement, ideas, resources. And some of you just felt less alone knowing that there are others stumbling and groping forward along with you (raises hand!). You just want to hear that you can live with it. A lot of you want to hear that you CAN homeschool with it. And from one busy mom to another – you can. But this is going to challenge you in ways you can’t imagine – it certainly has challenged and stretched me. I’m going to start telling my story here. This will be a beginning. And then, if there is interest, perhaps we’ll dig in more. After a challenging pregnancy (my 4th child) I was at a routine 1 month well-check for my baby when my pediatrician noticed my thyroid was large and I was diagnosed just a few months after that in mid 2008. My thyroid (a butterfly shaped gland at the base of the neck which controls metabolism with hormone regulation) was visibly swollen and blood tests would reveal that my thyroid was in the “hypo” phase – under-active and not producing enough thyroid hormone to keep my body running normally. Initially doctors looked only at my thyroid counts and immediately recommended drastic treatments. I kept pursuing a doctor that I could trust and eventually landed at Vanderbilt’s Endocrinology clinic (Nashville, TN) with an Endocrinologist that really took his time – both with me (he was very considerate that I was nursing an infant and post-partum) and my condition. It was during the months of blood tests, ultrasounds, and thyroid biopsies that I was finally diagnosed with Hashimoto’s disease, an Autoimmune disease in which my own immune system views my healthy thyroid gland as the enemy, attacks it, and is the most likely instigator for my postpartum thyroid issues. When I was diagnosed in 2008 I really didn’t have any hypothyroid symptoms. In other words, I wasn’t feeling poorly. After a year of patiently watching, my thyroid function returned to normal, where it remains to this day, and I went on with life as a busy homeschooling mom. Here’s the thing though, and it’s a big thing: Hashimoto’s symptoms don’t show themselves until your thyroid is damaged and compromised. This damage happens because, over a period of time, the immune system views the thyroid gland as a foreign object, and attacks it with the intent to destroy it. After enough attacking, the thyroid is damaged and can no longer manufacture hormones to keep the metabolism running as it should. Years went by. Another sweet little girl was added to our family. We monitored my thyroid carefully throughout the pregnancy and post-partum and all my levels remained normal. And then. Late in 2016 I began dealing with some disturbing health problems. They all seemed unrelated and, after all, I was getting older, so I just left them in the “you’re getting older” column and did what many probably do – treated the symptom(s). Below are the symptoms I was contending with, and though many of them are textbook Hashimoto’s symptoms, these were particular to me. It is not an exhaustive list nor is it a list that you should use to self-diagnose. And as you might imagine, my symptoms worsened over time. Until they were slapping me in the face and one day I realized they all intersected: HASHIMOTO’S!!! I went to the doctor, had my Hashimoto’s antibodies tested, and found that they were through the roof, indicative of the raging Autoimmune storm within me. Now I knew that to face the many symptoms that had become debilitating for me and were changing the landscape of my days, I would have to confront my Hashimoto’s disease. It was no longer lurking quietly in the background. Faced with an alarmingly high number of antibodies (an indication that my immune system was working overtime to attack my own healthy thyroid) and a litany of troubling and disruptive symptoms, I was motivated to make some challenging changes; I wanted my health back. It had now been long enough since my initial diagnosis that the Endocrinologist I so dearly loved had moved across the country, so I saw a local Endocrinologist, who was condescending and patronizing. Why? I don’t know. But it was discouraging and left me on a path of self-education which has brought me this far. I’m hopeful I can one day find someone to work with in the medical community because that’s my preference and hope! I can’t control the genetic predisposition, but I can do my best to heal my gut and to try to find what foods trigger my immune system to attack more. And that is what I have been doing for over a year and a half! I’ve been reading, changing the way I shop, reorganizing and shuffling my pantry, shifting the way I think about food, turning our kitchen culture upside down, and doing a fair amount of grieving as I say goodbye to foods I love but don’t love me back, and recovering – slowly recovering – my health. Let me say this part clearly: your lifestyle IS going to change if you have an Autoimmune Disease, regardless of your level of involvement. You can choose to continue to eat and live the way you are currently, and you can expect your symptoms to continue and worsen, thus changing your lifestyle, and not in a good way. (Raise your hand if you mentally map every restroom on your route if you are out running errands! Yeah – that’s not a part of my lifestyle anymore, but it was!) Or, you can get proactive. You can change how you think about food, change what you’re eating, and find healthy ways to deal with stress and activity, and learn to take care of your self. One of the biggest ways my lifestyle changed was in eating out – which I love. 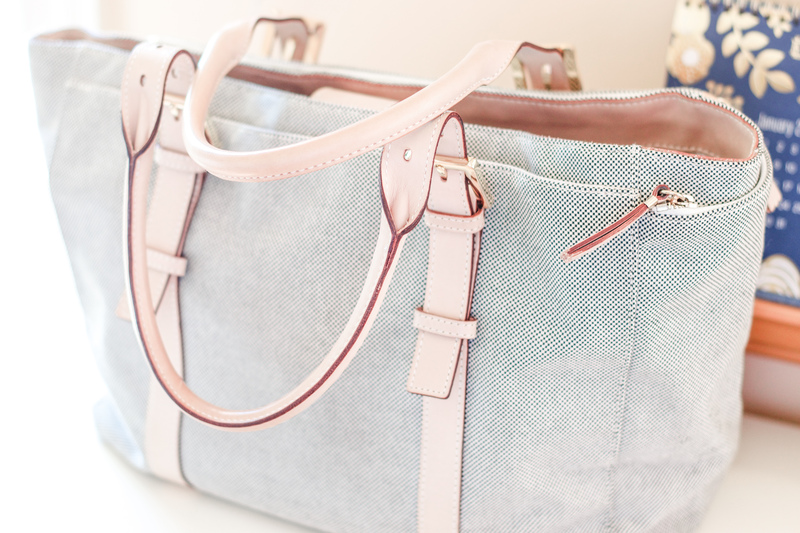 I’ve found a few restaurants that will work for me, but for the most part, I have to pack my lunches and snacks in my tote bag when I go out anywhere. Without a doubt, the biggest paradigm shift I’ve made has to do with kitchen culture. Every family has one and it’s generally a blend of your own family culture and your husband’s. My own kitchen culture is deeply influenced by my French Cajun roots. French Cajun food is rich and hearty and every meal starts with a roux (flour & oil). French cooking is an extension of love and hospitality and much of what I learned in my kitchen I learned from my French Cajun Granny. Whatever your kitchen culture, it probably embraces many of the foods that you’re about to eliminate. Such was the case for me. 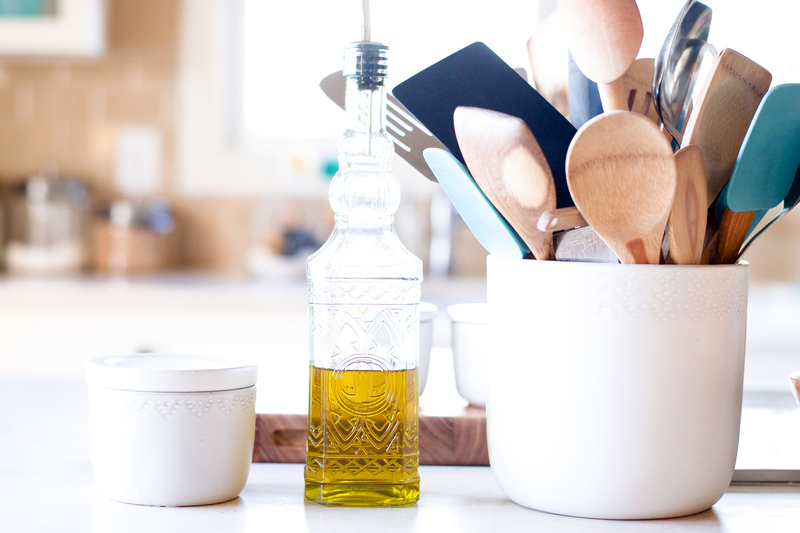 Our kitchen is the heart of our home, and dealing with my Autoimmune disease meant that I had to learn who I was in my kitchen – all over again. It wasn’t easy for me. I didn’t realize it at the beginning, but I would need almost a year to grieve before I could start trying to find my way in my own kitchen. I say that not to be discouraging, but rather, to give you hope and a clear and realistic picture. I felt so discouraged in the kitchen for so long. I didn’t even want to go in there, let alone make a meal. Know that this does pass, but I think it must be a component of this paradigm shift, and it was a painful one that I had to walk through. Three of my most favorite foods. I eliminated and challenged each of these foods again with the same result. Some foods (and this may be different for each of us) are consumed and actually trigger the immune system to attack, and since the autoimmune condition is present, the immune system attacks a healthy organ, like a thyroid gland in the case of Hashimoto’s. So…could I cheat? Yes, of course, and I’m not gonna lie – I have! But cheating has a direct and immediate negative consequence on me and on my health – and these consequences happen immediately! I had to experience that several times before I would finally accept that Autoimmune is lifelong, and this shift is lifelong, too. Letting go of these cornerstones of my kitchen culture involved a mourning process for me. I didn’t realize how important this was, but it was necessary for me. I love bread. Still do. I love making a deep, dark roux with flour. I’m not philosophically opposed to cheese. And roasted corn and tortillas – my love language. I guess what I’m trying to say is that for some people, there is no attachment to the foods they must let go, and for some people there may already be a friction that exists between that person and a particular food, making it easier for a person to let go. Not so for this french-bread-loving, cheesy-casserole-making southern girl. Still. A paradigm shift was in order. Pantry – clean it out! This is probably the first step I took that really set me up for success! Set aside an entire shelf just for you with bins for your own snack foods! Eventually, you’ll find ways to integrate how you eat with the family, but for now, it’s really important that you have a place to go in your pantry with foods that you can eat. Fridge – do the same thing – set aside a couple of fridge organizing bins or a shelf that is dedicated to food you can eat! I highly recommend these Oxo Produce Keepers – I love them! (I find the most useful sizes are the small and medium, but I like the large for green onions and bell peppers.) 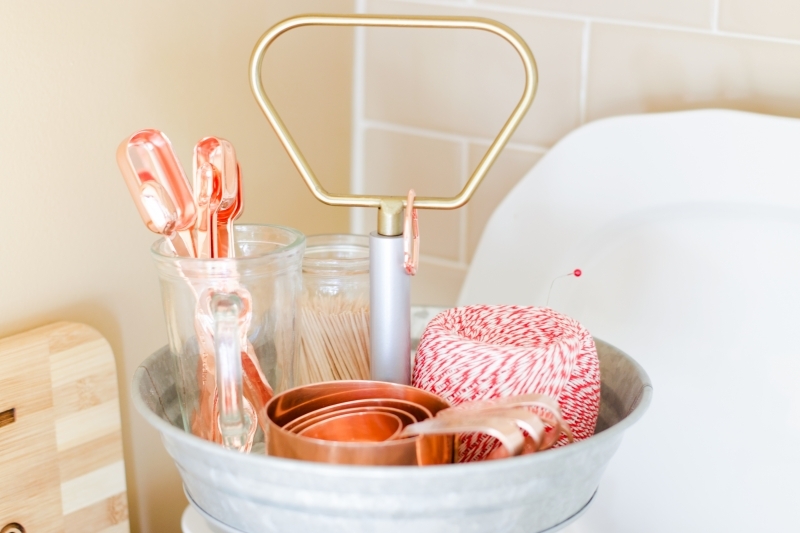 Because you’ll be buying more produce and berries and these help keep things fresh! Research AIP/Paleo friendly snacks and find substitutes for some of your favorite foods and stock them – don’t go overboard here, but do give your pantry some comfort foods you can eat! One of my favorites are the Siete brand Cassava chips (with lime) – I just love having something crunchy around! Meals: consider ways to transform/adjust some of your favorite comfort food recipes to fit your new way of eating – there are great dairy free substitutes that work well to stand in for cream (I love Califia Farms), and many times you can substitute something like a gluten free fried onion (I like the Whole Foods brand) for a topper instead of cheese. I shot for an 80/20 approach to cooking – I would make a meal that I could eat 80% of (usually the meats and veggies) and try to leave 20% for the rest of the family so that they still had their comfort foods (mac and cheese, bread, etc) and weren’t forced into my world. That approach has worked well for me and I still shoot for 80/20 when I cook. Start looking for cookbooks that offer recipes that are similar to your cooking style and start re-learning! My hands down favorite series are the cookbooks from Danielle Walker, and her latest cookbook, eat what you love, is a family favorite! Celebrations got me through Thanksgivings and Christmas and special events. Finding Danielle gave me hope and a vision for going forward and recovering our kitchen culture. Find a cookbook author that does that for you! Above is my collection of cookbooks. 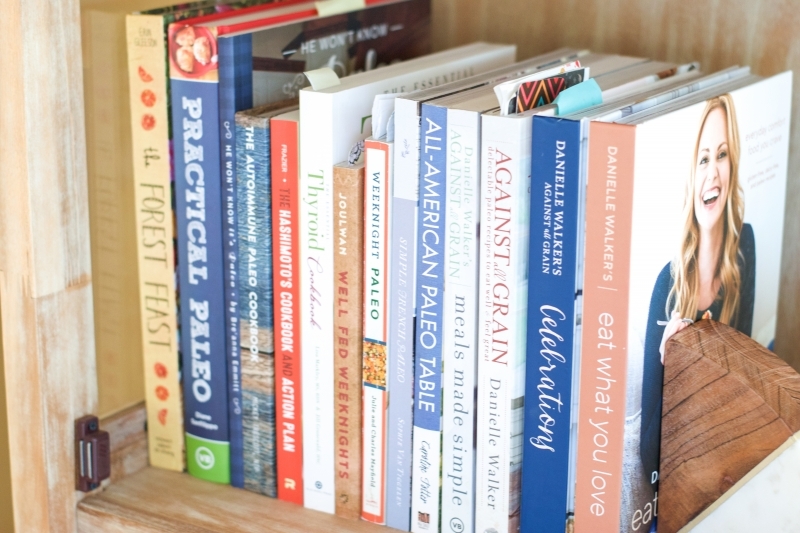 Each of these cookbooks has helped form my understanding of Hashimoto’s and how to cook for my Autoimmune Disease, and each of the cookbooks has contributed to our family kitchen culture! I think if you’ve gathered anything at all from my own sharing about my journey it is that this is a big shift, and many aspects are overwhelming with symptoms and considerations to sort through. One of the most surprising things I learned in this process was that one of my symptoms is a neurological symptom and it is the first thing to show up if I have something questionable in my diet. My arm will tingle and become numb at night. Not all the time, and no I’m not having a heart attack or a stroke. The arm tingling will happen almost immediately if I eat any grain, or dairy. I never would have discovered that connection if I didn’t keep a journal. And that’s why I highly recommend you start one if you’re on this journey with Autoimmune! When I started this journey and completed my first Autoimmune Protocol I was utterly overwhelmed. There were so many foods on my no list, and my list of symptoms was long. 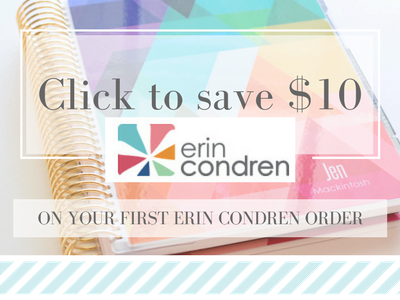 I wasn’t sure what to expect so I dedicated a weekly planner (an Erin Condren Life Planner in the vertical layout) to journal exactly what I ate, along with my exercise/daily activity, and any symptoms I felt. 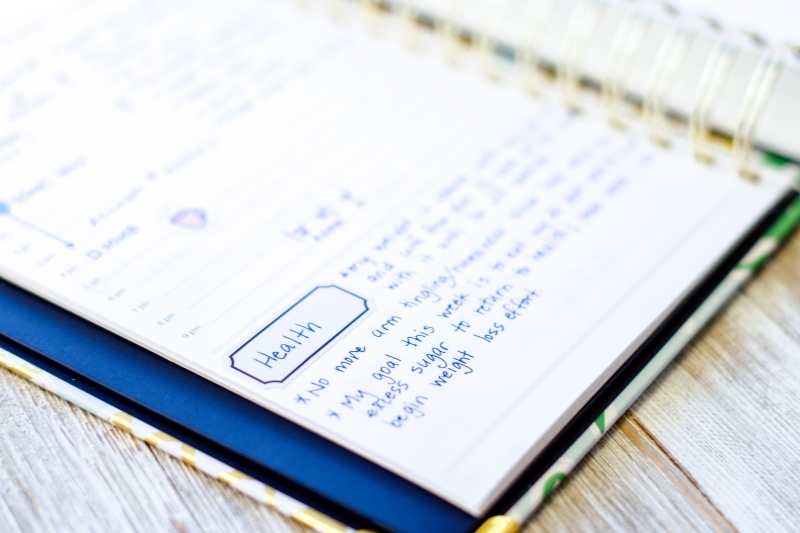 It was a huge relief for me to get it on paper and not have to remember it all in my head, and it enabled me to really take the reins of my health back. I cannot recommend this highly enough if you’re beginning your journey, or if you haven’t really committed to that full paradigm shift yet! 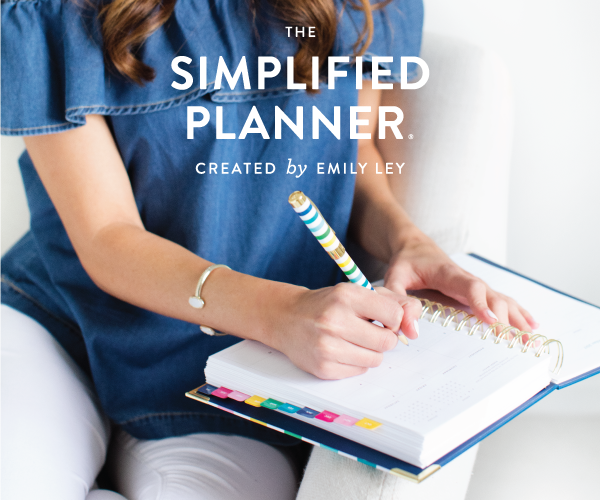 Clean and restock your pantry, find a few meals, and start with your wellness notebook. Take back your health. There are a few books that have been integral for me. They helped me understand Autoimmune disease, thyroid issues, and how to eat a very restrictive Autoimmune Protocol diet (and why that is helpful in the first place). The Paleo Approach: Reverse Autoimmune Disease and Heal Your Body by Dr. Sarah Ballantyne – this book is not an easy read but is so worth your time if you want to understand the science behind what is happening, and the science behind why your diet has a relevant and primary impact. Practical Paleo by Diane Sanfilippo – this is my favorite book! As in, if you only get one book, let it be this one. I had it before I was diagnosed and it was the first book I turned to, and it is the book I continue to crack open. It is approachable and ever so practical and understandable! Perhaps you think this book is just about eating Paleo? I suppose you’d be partially correct, but it’s about so much more – the why, the how, options, meal plans and so much more. Whether you have an autoimmune condition or not, this book is worthwhile. He Won’t Know It’s Paleo by Breanna Emmitt – this unobtrusive cookbook was a faithful help to me when I found myself overwhelmed by the Autoimmune Protocol diet (AIP) and the number of symptoms I was dealing with. Everything in this cookbook is AIP safe and gave me hope that I could cook for myself and my family. The Essential Thyroid Cookbook: Over 100 Nourishing Recipes for Thriving with Hypothyroidism and Hashimoto’s by Lisa Markley and Jill Grunewald – this book is only half a cookbook! In the entire first half of the book, the authors explain the specific nature of Hashimoto’s and how diet relates to Hashimoto’s. It’s extremely helpful! 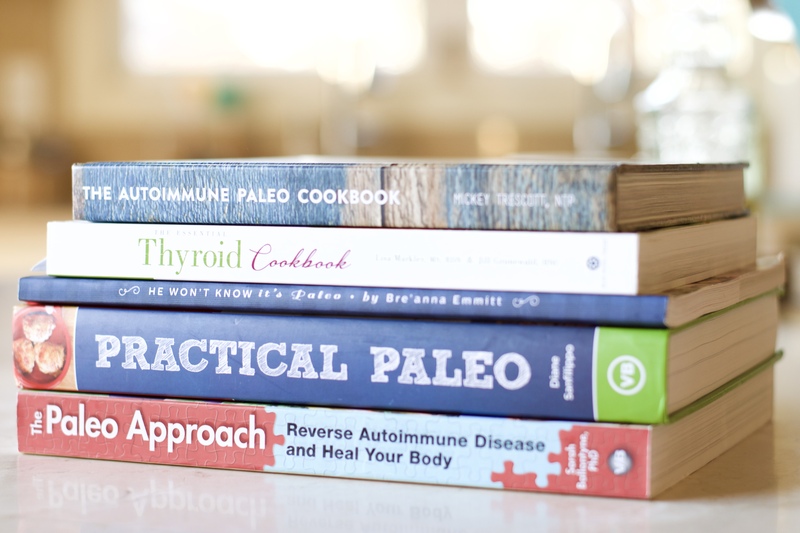 The Autoimmune Paleo Cookbook by Mickey Trescott – While this book has a very helpful, succinct introductory chapter, the bulk of the book is a cookbook and definitely one I found most helpful. A dear friend let me borrow her copy when I started AIP and I found it useful enough that I wanted a copy of my own. The recipes are all AIP friendly, and when you’re lost not knowing what you can make…what ingredients you can even use…Mickey’s book spells it out and makes it feel do-able. 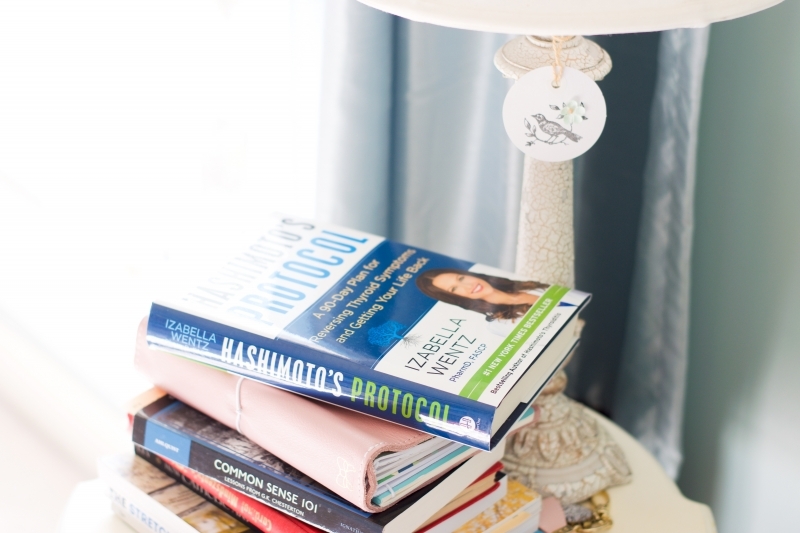 In a category all its own is Dr. Izabella Wentz‘s book Hashimoto’s Protocol. It’s essential for understanding Hashimoto’s disease. Dr. Wentz is a pharmacist who, herself, has Hashimoto’s. She applied her medical knowledge with her understanding of nutrition and lived it. Then she helped others live it. And after enough time and experience, she has a body of work that is really helpful and hopeful! Her protocol, while challenging, is thorough and well-researched. My only complaint is that I don’t think there is a clear resolution for a way forward at the end after the elimination diets. The protocol is thorough and the application principles are clear, but I felt the clarity ended there. Which is why I highly suggest this book after you’ve read a little more on Autoimmune Protocol and Elimination diets so that you’ll know your way forward after completing the protocol. But the value in this book is in her research and clear understanding of Hashimoto’s and its behavior. If you have Hashimoto’s disease, this book should be in your hands. 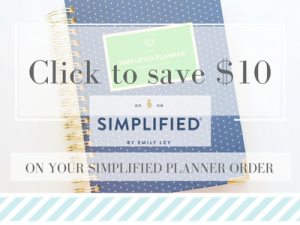 Her website and newsletter are favorites of mine, too, and I’ve learned much just from reading those (all free!). Be sure to sign up! In addition to kitchen culture and changing my diet, I needed to dramatically shift my self care routine as a way of assisting my best efforts that, I hoped, were working from the inside out. I have to be completely honest. My self care routine was pretty non-existent. So, once again, I was in for a challenging paradigm shift. Maybe it’s helpful to note that I didn’t focus any effort on self-care, other than the obvious need for rest, until I had completed about 6 months worth of dietary changes and didn’t feel so overwhelmed in that arena. At that point, I was ready to take on more. My nail health has been one of the slowest symptoms to show improvement. I’m working on nail strength from the inside (collagen and supplements) and also from the outside. There are a few products I like a lot that have helped. For overall nail health I love Bliss Kiss nail oil. For a natural look, I like Zeva Nail Bright – One Step French Manicure – it’s not harmful and one simple coat helps the nail look healthy and natural. I really appreciated that when my nails were really struggling and didn’t look healthy at all! For color I like Julep nail polish (especially the oxygen nail strengthening treatment), Zoya polish and remover. Lash Boost – Alright. So. Hair Loss. It’s real and it’s also really unsettling. My hair thinned quite a bit (it’s finally growing back in after a year of really targeting my health!!! ), and my brows and lashes weren’t spared either. I used Lash Boost on my lashes AND my eyebrows and built both of those areas back!! To say that I’m thrilled would be an understatement! Is it pricey? Yes. It is. I considered it an investment purchase in my femininity and sense of self and I still use it (just less often). I will add that it does last me quite a long time so the initial investment continues to give results over months! Active Hydration Serum – Skin dryness is another hallmark of thyroid conditions. What became so challenging and frustrating for me is that my late 40’s skin couldn’t decide if it should be oily…or dry…or both. Targeting one really frustrated the other. Until Active Hydration Serum. I don’t know what to say about this magic elixir, but if you make the jump you’ll never go back. It smooths and hydrates my skin in a way I’ve never experienced before without leaving a greasy feeling. Again, an investment, yes. But I love it so much that I had to mention it. I use it on my face and neck and even my hands! 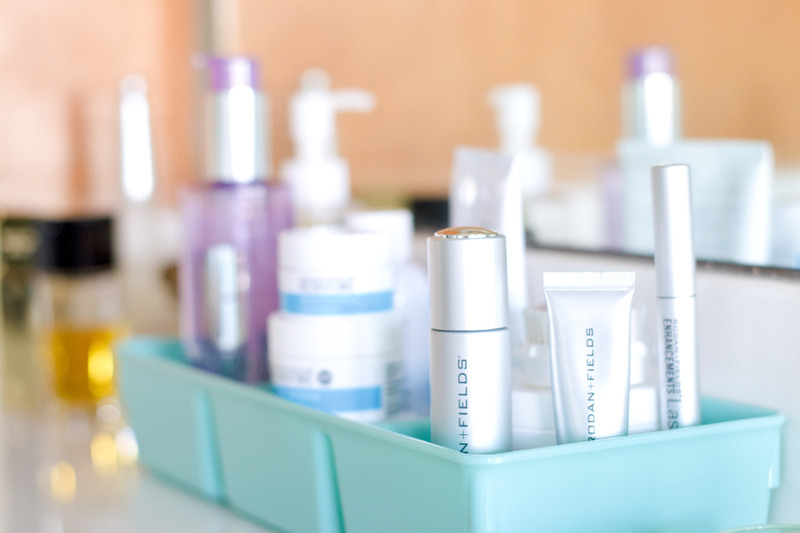 Redefine regimen – and really, all the different regimens that R+F offers. I happen to love Redefine because it is so smoothing and leaves my face clean without over-drying it. The results are pretty astonishing if you use the regimen regularly. This one was hard for me. I’m an active person. I volunteer at our parish, I blog, I homeschool 4 of our 5 children, I manage our home. I thrive on activity. Hashimoto’s would teach me to pay attention to rest – to plan for it and value it. 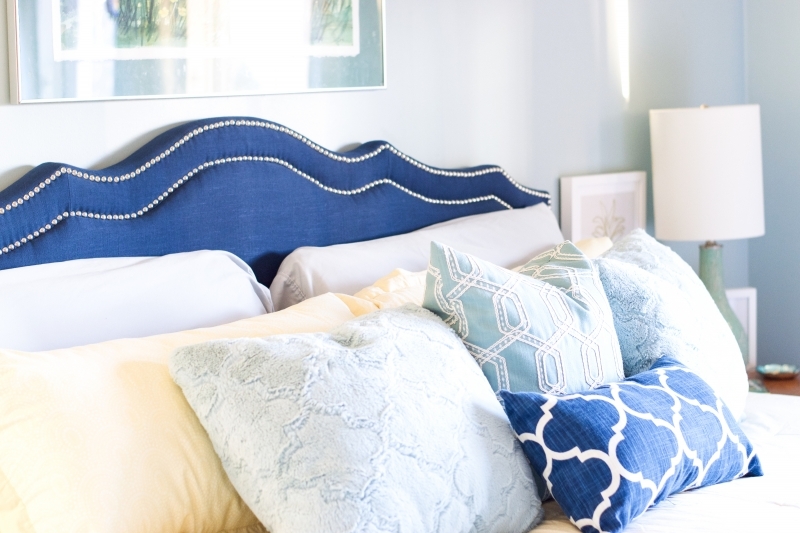 Carve out restful corners in your home. Give yourself permission to call an “all-stop” if you need an afternoon of rest. Along these lines, homeschooling became challenging for me when my symptoms were at their peak, and also as I recovered my health. I had to shift my style and our schedule a little bit so that I could accommodate my health and my need to rest more. Home education is imminently flexible – don’t be afraid to flex when needed! I think we set up expectations in our mind of how a thing should be…or could be. But in the end, if you wrap yourself in a shroud of expectations and spend all of your energy trying to follow a curve that isn’t meant for you, or your health right now, you will overspend yourself, and the results of that won’t be pretty for anyone. Instead, drop back to basics – which, in our home, is always going to be rich reading. Think of your homeschooling game plan in layers – it helps me to draw/map it out and name ‘the layers.’ You might have an out-of-the-home-activity layer, a craft time layer, a daily walk layer, reading lessons, read aloud time, math time. Think of your homeschool layers and just get them on paper. What is the most foundational layer in your list? For us, it is reading: living books. So, I dropped back to reading for awhile. No one was scarred or hurt. My kids moved forward all the same. My senior is still graduating and none of his post high-school plans were curbed because Mom dropped back to the most foundational layer for awhile. And I was able to slow down and rest – so essential for my health at that time. I’m projecting a little based on the many questions and emails I get from you, but I’m guessing that giving yourself permission to drop layers that are stretching you too thin is going to be your biggest hurdle. Remember, this is just for a season to allow you to restore your health. Will your kids suffer mental damage if you ask them to sit out a season of soccer or drop weekly craft time at the neighbor’s house? NO!!! They will survive!!! But the entire family WILL suffer greatly if your health continues to decline. FLEX!!! BEND to the challenge and cross you are carrying!! 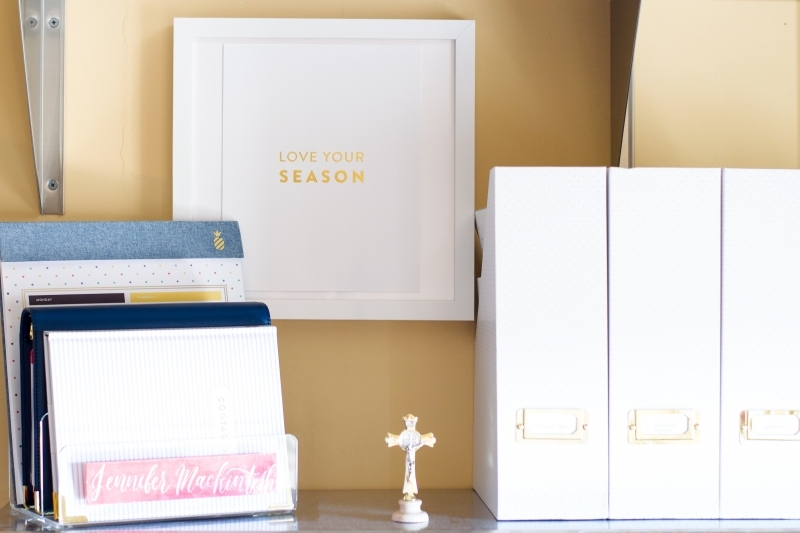 Let the beauty and flexibility of homeschool shine in this season! At this point, now that I’ve addressed all of my symptoms my need for rest is much less frequent, and we’re back to a more regular routine. But there are times that I feel my energy stores depleted and the need for rest presses on me. And I answer by stepping back. Keep your rich “layer-plan” in mind, and drop a few of those worthy but unnecessary layers when necessary, reminding yourself that you must live the season God puts in front of you! Everything has a season. Even Hashimoto’s. Let yourself rest and let the kids read. It’s a season. Return to rich layers as your energy and health return. This is the part where I wrap it all up in a pretty bow and tell you that I’m in remission, that I’ve got the diet thing figured out and dialed in, and that my life is transformed. But that wouldn’t be true at all. So let’s put the bow aside and deal with reality. This is a cross. And it’s lifelong. Hashimoto’s disease is a chronic condition, and though it is possible to achieve remission, the disease is incurable. The reality is that I’m still struggling – some days more than others, but I’m learning to listen to my body when it tells me to slow down. The reality is that my diet is better – full of whole foods – and I’m back in my kitchen and really enjoying creating there again, but there are days I crave a burger and etouffee and cheesy-gooey lasagna. This journey is one step forward and two steps back. It’s imperfect and messy and challenging. It’s so important not to be discouraged by those steps back though! Every time I hit a bump or a challenge it teaches me a little more, and it builds my overall understanding of this disease and how my own body reacts. This is my season. Autoimmune doesn’t define me, nor do I allow it to consume me; it is simply part of the landscape of my day now. And if it is a part of your landscape, I pray that something here was a help or an encouragement in living with this cross. Thank you so much for sharing your story with us, Jennifer! I’ve recently been diagnosed with anxiety and depression, and I see how I need to look at my life as a whole to fight back against that as well. I paused in reading this post to look up some diet changes that might help me, and sure enough, there are. Its easy to look through the lens of social media and figure other women have it easier- thank you so much for your vulnerability and generosity of information. God bless you on your journey!! Thank you for your candor! I can truly empathize, as I have been struggling with auto immune and fool allergy issues for years, and without any drs being able to find the “root” cause. I look forward to researching Hashimoto more, and sharing with my dr, because I have a lot of symptoms similar to yours. You’re so right! We have to become very educated advocates for ourselves in this journey, especially if we’re ever going to get to that root cause! Praying as you search for answers and direction! Thank you so much for sharing! This is a beautiful post that certainly left me teary as I can relate so very much. I do not have Hashimoto’s but I do have autoimmune and genetic issues that have reared their ugly head over the past few years. I’m down to paleo and no nightshades in the food category and agree, it is so very hard at times! There is so much letting go with these crosses: from the very tangible things like food, to the visions and hopes for our homeschool, to the relationships with family and friends who just do not understand. So much. I will keep you in prayer as you continue in this journey. Trading prayers with you! You’re so right – there is so much letting go! I pray that the letting go is making room for more virtue in my life! Thank you so much for sharing your story with me! Sending so many hugs and prayers! I relate to this on almost every level. And grief is such a perfect way to describe going through something like this. I also love how you talk about thinking about things in “layers”. I had to do that and it was so challenging – and letting go of the guilt that sometimes came with accepting I couldn’t do a certain layer at specific times. Thank you for sharing! Letting go of layers is so hard for us. We work hard to consider those layers and construct them, so letting go is yet another form of detachment and trust. But it becomes abundantly clear at certain points that detach, we must! Thank you so much for your kind words, Sarah! Oh, thank you SO much for sharing your journey with us! I, too, live with autoimmune disease and it is a rocky road indeed! I trust in the Lord, place myself in Jesus’ hands … and work hard to maintaine my health. There are better days and harder days, but it isn’t ever easy. Blessings to you and your family as you continue to navigate this lifeway. For myself, what I eat is key (I have about ten, literally, ten safe for me foods), and in addition to that, sleep and fitness, and meditation and prayer. And reducing, and coping promptly with, stress. You’ve got it nailed down!! It doesn’t make it easy, but there is peace in having that clarity of what we can and cannot eat, isn’t there? Still, having 10 safe foods is challenging, at best! I’m so grateful for your kind words! Jen, my son had the exact diagnosis at age 18. Dealing with his parents’ separation added even more stress. He took a year off after high school to deal with his health and this new way of eating. His hope was discouraged after dealing with doctors who weren’t very thoughtful or considerate of how they spoke to him. (Remember, he was 18.) He started seeing a wonderful naturopathic doctor. Their conversations revealed more foods he could not eat. My son was so discouraged. Ice cream, cookies/cakes, sandwiches, pasta, …. all gone. Then he went away to a college where the students have kitchens in their rooms to cook their own meals (no cafeteria). He slowly accepted his condition. Here is where YOU come in, Jen. Around that time you started discussing having Hashimoto’s, as well, and posting photos of your meals. I would immediately send him the pictures (and still do) to give him ideas of meals to eat — especially breakfast. I thank you and my son thanks you. We are truly grateful for you. He is now 21. He recently told me that he has slowly grown accustomed to this new way of eating, and may not go back to eating the way he did before the diagnosis. He feels so much better! Thank you, Jen! I will send him this post, as well. You can relate to and understand what he is dealing with. Oh my stars! I am so humbled!! Truly! This is not an easy cross for anyone, but as a young man at college this would be particularly heavy! Still, I have learned and grown so much in virtue though this, especially the virtue of temperance! I’m so grateful for those lessons! I do have to admit, I feel a little silly when I share pictures of my meals on Instagram, but your words and experience are very encouraging! Sending prayers as your son walks this forward!! Thank you so much for your kind words! Thank you so much for sharing all of this! I struggle with Celiac’s disease. It really was a grieving process many years ago as I figured out what I could and couldn’t eat. You summarized everything so well as you always do. Please keep sharing more about your journey! Thanks for being so real and open about your struggles as well. Thank you so much! This post wasn’t easy to write, but the response has been so overwhelming! I’m so grateful for all of you! Thank you so much, Jennifer, for sharing your story and the information you have garnered. I was diagnosed with Hashimoto’s just about a year ago. I had been diagnosed with hypothyroidism 2 years previously although when I think back, I am sure it began after I had my son 11 years ago as I have been suffering with many of the symptoms that you mention. I am also a homeschooling mom plus I work full time. I was thrown for a loop when i was told I had an autoimmune disease. I have been trying to digest what this means and really not knowing where to begin to help myself. I have been on Synthroid for 3 years and it has helped some of my symptoms although not all of them. I found your website through a Seton Home School recommendation and I feel so blessed that God put you in my path at this time. I have felt very alone on this journey even though my husband is very supportive. Thank you again for this post and I look forward to any future sharing you will do. God Bless! Oh my goodness! I know EXACTLY where you are with this!! Many are given synthroid to help with thyroid function, and you CAN still target this while on synthroid. It really is such an overwhelming volume of information to take in and sort through at first!! I’m so grateful you’re here and that we can walk this together! Sending prayers as you walk this forward!!! Thank you so much for your kind note!! Thank you, Jen! I was diagnosed with a goiter years ago but through bloodwork was always told that my thyroid functioned properly. Last year my ENT casually mentioned Hashimotos and in doing research I was floored that I had 9 out of 10 symptoms. Anxiety, irritability, brain fog, exhaustion, etc. I chalked it up to being a mom of 3 and my age. I came across Dr. Wentz and her protocols and completed her Root Cause Reset in October. I felt about 80% better afterwards but am at a total loss on what supplements I should be taking after completing that program. Her process is really unclear unless you want to pay to join her followup program. Would you share what supplements you are currently taking and what times of day? I’m in the grieving stage with my diet but know that I need to get on board with my new lifestyle going forward. Are you on thyroid medication and does it help any? I’m looking forward to trying some of your recommendations. At this point, I’ll try anything! Thank you for sharing this post. I take comfort in knowing that I’m not alone in this process. Isn’t it amazing how we can have a goiter, and have symptoms, but our thyroid numbers fall in normal ranges! Yes, I’ll be happy to share my supplement regimen with you, with the proviso that I’m still fine tuning! And no, you are definitely NOT ALONE! So glad to be alongside you!! Thanks for sharing. I had health problems, nothing diagnosed, but went through diet changes and am now gluten free and milk free. I also find corn is not good for me too. I was actually not too upset giving up these foods as most people are probably healthier without them (wheat and milk are not the same as they were just 100 years ago) but my biggest cross is that my husband feels restricted by my diet. He gets annoyed about it saying he just wants us to be ‘normal’. He seems to think I am a tiny minority and often reminds me that I am the only one in my parish asking for the gluten free host (or technically low gluten host). I personally feel most people out there have not realised that diet could help with their health problems. Eating out, rare for us, but even so – it is a struggle to find somewhere healthy enough and going on holiday is even worse as if they do cater for gluten free food it is really poor quality and mainly contains corn. Also, we get so many invitations to weddings, baptisms etc… and people do not ask for dietary requirements and there is not much I can eat. I feel I can cope with the struggle but it’s when my husband gets upset about it that I find it all difficult. That is a definite added cross! I’ll pray you can find a way to confide the weight of this to your husband! Eating socially IS challenging! I love being social and love eating out. Oh my stars! I LOVE eating out! But I don’t want MY autoimmune condition to become a focal point when I’m out socially, so I decided to research a menu ahead of time and I’ve learned some things I can order and do to allow me to remain social without eating poorly. I don’t make a big deal about ordering a salad with oil and vinegar, and many times I’ve asked a restaurant to send out the burger minus the bun…and then I just move on with enjoying the time I get to spend with friends or loved ones! Steak houses are actually great places to eat GF and DF. So many restaurants are offering sweet potato fries now! Also, salads at Panera Bread, and grilled chicken nuggets at Chick fil a (although I think technically there is some corn in the grilling sauce but it isn’t enough to bother me). Oh, and Chipotle if you can do legumes and rice! Hope some of these give you a few eating out ideas!! Thank you so much for this post. I also have Hashimoto’s and found your routine to be attainable and effective. I feel like this community is very all or nothing and your approach seems manageable when you seriously feel like you can hardly get up sometimes let alone deal with all of the extra stuff. Would love to hear more about your journey when you are able to share!! I’ve actually been looking into Beautycounter quite a bit lately for the same reasons!! It’s not a coincidence that we’re headed down the same path! The cosmetic field is so widely unregulated and it’s been surprising to me how many reactions can and triggers can be in place…from cosmetics! Sending prayers your way as you walk this, too!! God bless! Jen – I’ve been following you over on IG and wanted to read this post. I definitely need more time to really read everything, but from what I have read, thank you so very much for sharing. I was diagnosed with Hypothyroidism/Hashimoto’s back in 2006 as the result of trying to conceive. My doctor immediately put me on medication and I’ve been with that ever since. As you mention, I typically cannot tell my symptoms. The doctor asks and I always answer yes I’m tired, yes I have combination skin, yes I’m tired, I’m tired. I’m a middle age mother homeschooling younger children. I’m busy. It’s life. In recent months (ok well actually after having my third child at 42) ahem, several years ago, my health has not been the same. I suspect though that my hypothyroidism is an enormous part and I have wanted to start taking better care of myself this year. My numbers from blood tests always come back “normal”. I also have two kids with food allergies (that are different from each other) and I constantly struggle with picky eaters! Ah, the craziness. Anyway – I really wanted to thank you for this post because I know there is hope for me to feel better and eat healthier. It’s so overwhelming trying to figure it all out. You are very kind to share all of this information and of course it is different for each of us, but I plan to tap into the books/cookbooks and start taking charge. 🙂 God Bless You! It really is very overwhelming, Amy! There are so many pieces of the puzzle to try to fit! Praying that there is something here for you take and move forward! And…I’m so glad to have you along on IG!!! 🙂 God bless!!! Thank you, Jennifer! I just read your article and then took a refreshing nap! I have hypothyroidism (not sure if it’s Hashimoto’s). Too often I try to power through instead of giving my body the rest it needs. Thanks for encouraging us to give our bodies what they need! I’m so grateful for your kind words! I just want you to know I read this and my heart is filled with so much love for the kind of woman you are. Keep working hard to be healthy and your best. Your family is better because of you. I have s feeling many people are. Such kind words! I’m humbled. And grateful!